If you have an older iDevice such as the iPhone 3G or iPod Touch 2G then you are probably aware that Apple limited features on the iOS firmware generation. These feature limitations include the ability to natively multitasking and also the ability to have custom homescreen wallpapers. 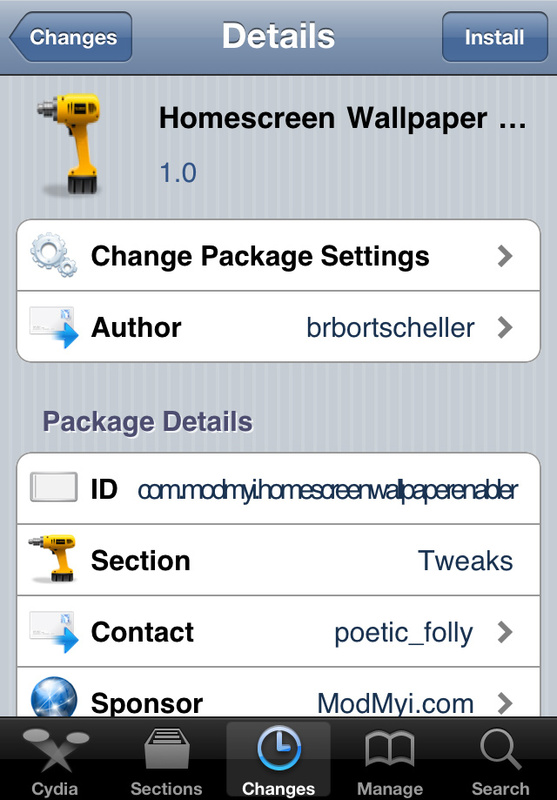 If you are interested in the HomeScreen wallpaper tweak then it is available through Cydia for FREE. Let us know if you used this tweak to enable homescreen wallpaper functionality on your older iDevice in the comments section. As you can see if you watched the YouTube video above, this new notification system is a great alternative to Apple’s stock iOS notification system. The tweak works with the following applications. If you are interested in IconNotifier it is available through the Cydia Store for a price of $2.99! A new tweak hit Cydia called SwipeNav. This new tweak allows you to visit a previously viewed page by simply swiping Left to Right. A very handy modification that can add a lot of productivity to your device in a very non-intrusive way. If you tested out the SwipeNav tweak let us know your thoughts on it in the comments section. A cool new tweak was released into Cydia called FlipOver and this tweak actually allows you to mute or lock your iDevice by simply turning it face down. If you then turn your iDevice face up it will unmute or unlock your iDevice. A cool concept don’t you think? Personally after looking into the tweak I can conclude that it does work as advertised and can be quite useful. Upon installing the tweak you will find a tab in your Settings.app where you can configure different aspects of FlipOver such as Sensitivity. If you are interested in FlipOver this tweak is going to cost you $0.99 through the Cydia Store. how can you choose the background you want to place? can you please help us solve this problem?? Finally found an app in Cydia that does what I want and doesn’t crash my iPod 2G. Thanks! Yes,it lost the phone.That creep’s gonna die if he don’s reply me. the phone app was missing in the dock when i enabled homescreen wallpaper tweak is there anyway to use this without the phone app missing in the phone dock? is that will works to iphone 2g???? what the? I tried to install it but the ipod touch just… crashed? I don’t see any difference in the ‘wallpaper’ section on my settings. Help please? I got it working, see my post here. Its related to changing a string in a plist file from Phone to any-telephony. First, open Winerboard and uncheck the Homescreen Wallpaper… theme and respring. Open iFile (get from Cydia) and navigate to /Library/Themes and open the Homescreen Walpaper Enabler.theme folder. Keep going until you see a en.lproj folder and 3 .plist files. The en.lproj folder is where the “slide to unlock” text is replaced with HomePaper On”. I deleted the folder because I prefer the origal text. If you have a iPhone 3G, we will be working on the N82AP.plist file. The others are for iPod Touch and other phones. Tap on the file and open with iFiles Text Viewer. Tap Save, then Done and go apply the theme! PS Futher down you will see an entry for multitasking. Set the key below it to true if you want force multitasking on. WARNING: You may experience reduced performance and battery life. It’s working , on my Iphone 3g 16 GB 4.0.2 thx bro! Hell yeah, glad I could help. Glad to see my post is still getting some use. Sorry I cant help other than whats posted here. I havent had an iPhone since June. Yo, thanks so much bro ive been tryin to find a way 2 do this ever since I got my ipod. wait, um, how exactly do I use this?